Erica Markowitz is an associate in Herrick’s Corporate Department. She focuses her practice on securities and capital markets, including underwritten offerings and corporate governance, representing public companies in the REITs, technology and pharmaceutical industries. 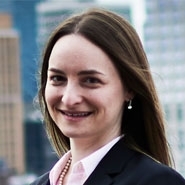 Erica also provides counsel to registered investment advisor clients on compliance matters and is an active member of the firm’s Information Governance Group which advises clients on cybersecurity, technology and privacy matters. Prior to joining Herrick, she was a capital markets associate at Fried, Frank, Harris, Shriver & Jacobson LLP. Erica interned for the Honorable Nina Gershon in the United States District Court for the Eastern District of New York, and the Honorable Harold Baer, Jr. in the United States District Court for the Southern District of New York.